Even though spring is just rubbing its eyes and beginning to stir, this is actually a great time to prepare for the next winter by installing a radiant heat system. Early bird discounts may apply to self-regulating roof deicing systems as well as ClearZone snow melting systems. 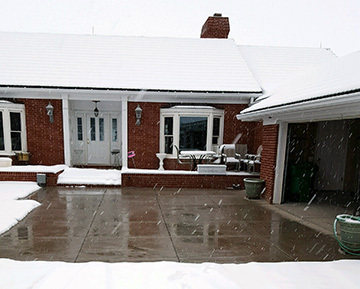 Installing a heated driveway or snow melting system in early spring puts you at a distinct advantage versus installing one later in the year. During the summer “construction season”, contractors are often unable to complete all of their projects. So, when fall comes, builders compete to purchase the necessary products to complete as many projects as possible – and the availability of dependable contractors may be limited. However, finding a contractor before the fall rush allows you to take your time interviewing and selecting the professional you deem best for your project. 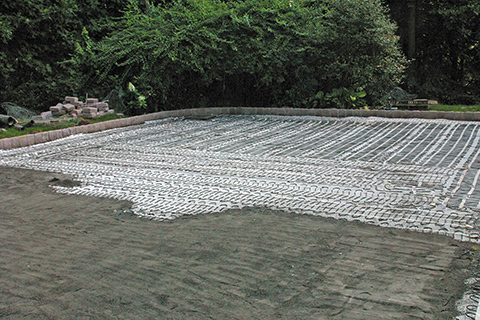 A radiant heated driveway being installed. In terms of finding the best installer for your radiant heat system, Warmzone also keeps track of experienced installers who have installed radiant heat systems successfully. And keep in mind, radiant heat applications are extremely flexible and adaptable, offering homeowners many options to achieve their goals, so don’t be fooled by expensive quotes with limited options. Whether you’re pouring new concrete or repairing existing pavement, radiant heat installation is an excellent home investment that not only preserves and protects your property, but also helps to prevent slip and fall accidents, as well as injuries from shoveling. Snow melting systems can also save you the time, and eliminates the added expense of hiring a snow removal professional to plow your driveway. With radiant heated driveways and walkways, you get fully automated snow removal, and the opportunity to experience dry pavement all year round. And the fully automated systems operate silently on renewable energy. In addition to providing industry leading snow melting, roof deicing and floor heating solutions, Warmzone’s customer services are unmatched. Each and every radiant heat solution you purchase from Warmzone comes with a professional consultation, including an AutoCAD system design, so you’ll know the proper layout and materials, proper load calculations, breaker sizes, number of breakers, and performance expectations for your project prior to installation. Free installation training courses are also provided by Warmzone. These services are second to none in the industry, and are included for each Warmzone customer. For more information about radiant heat systems, contact a friendly expert today at 888.488.9276.